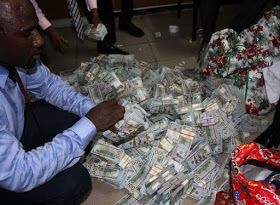 N23, 218,000 was discovered in Ikoyi, Lagos State. of the National Intelligence Agency, NIA, Ayo Oke as the owner of Flat 7B, No. 13, Osborne Road, Osborne Towers. Ventures Limited, to which she and her son, Master Ayodele Oke Junior, were directors. subsequently paid it to Fine and Country Limited for the purchase of the property. final forfeiture of the recovered money to the FG. 0 Response to "Finally! EFCC Reveals The Owner Of Ikoyi Flat Where N13 billion Was Found"